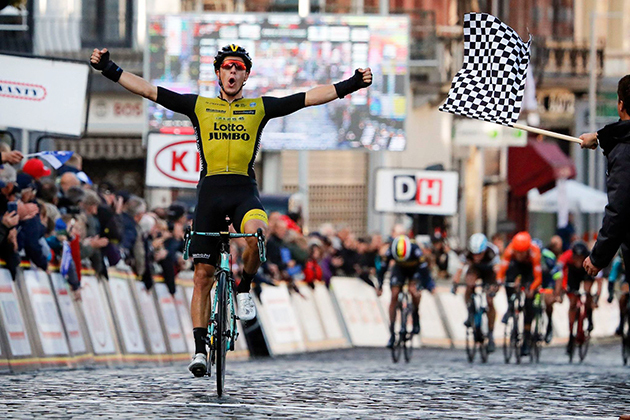 We posted the report from winner Danny van Poppel's LottoNL-Jumbo team with the race results. Three months after riding to a beautiful and memorable victory at the Belgian Championships, Yves Lampaert returned to Binche for the 31st edition of the Memorial Frank Vandenbroucke as part of a strong Quick-Step Floors line-up, which was back in action nine days after conquering the gold medal in Austria, at the World TTT Championships, where Yves was among those playing an important role in this extraordinary feat. The second part of the 197.4km-long race consisted of five laps of a rolling circuit which included also an uphill cobblestone sector, and it was on the third of these laps that a large group took off from the peloton. Both Yves Lampaert and Zdenek Stybar featured in that move and brought their fair share of pace-setting, helping the newly-formed group put one minute between them and the bunch as they approached the last 25 kilometers. After several skirmishes, all easily nullified, Zdenek Stybar kicked clear of the group and helped by his teammate, who duly shut down all attempts to chase him, opened a 25-second gap over his former companions. Despite not being favoured by the long and exposed roads inside the last ten kilometers, Zdenek continued to press on, hoping he could repeat the 2014 victory, but the pack's concerted efforts got him reabsorbed with the flamme rouge in sight. As Lampaert was moving through the splintered field towards the front with 800 meters to go, Danny Van Poppel (LottoNL-Jumbo) accelerated and powered to a solo victory in the small Walloon town, where Yves concluded second for his eighth podium of the season. Apart from Yves, two more Quick-Step Floors riders finished in the upper part of the general classification, Danish stagiaire Mikkel Honoré (11th) and Philippe Gilbert (15th). Danny van Poppel is the day's fastest rider. Cor Vos photo. "The race was closed in the first part, due to the headwind, so it was on the local laps that we tried to put things in motion, but it didn't work, as many riders were still fresh. Eventually, we managed to put two guys in a big group of twenty riders, before forcing a selection and reducing the number of the men up front to just eight", said sports director Rik van Slycke. "Styby went from afar, and despite not getting too much space, he really believed he could make it and gave everything out there. When he got caught, Lampaert came forward and took a solid second, while Mikkel finished not far off, after helping the team throughout the race. I think we can be happy with how we raced today, animating the race and trying to seize every opportunity." Three of the younger riders on BMC Racing Team’s Binche-Chimay-Binche roster helped to animate the closing kilometers of today’s race before Jempy Drucker finished just outside the top five after a tough uphill sprint to the line. As is expected in Belgium, it was an aggressive day of racing starting from kilometer zero, and despite allowing various groups to try and go away early, the peloton was still all together after covering a little over 60 kilometers, of the 197.4-kilometer course. New attacks quickly followed with riders sensing another opportunity to distance themselves from the rest of the field, and it was a group of six riders that was able to open up an advantage that was sitting at almost three minutes less than 15 kilometers later. At the start of the first of four laps of the 16-kilometer long finishing circuit around Binche, which included an uncategorized climb as well as the short but sharp cobbled climb up the Rue de la Pépinière, the new breakaway was hovering just 30 seconds up the road. The peloton, which had shrunk in size due to the intense pace being set as well as strong winds and wet weather, continued to drive a hard pace and as a result, the race was back together, and more riders began to try their luck, with 56 kilometers to go. Tom Bohli, Nathan Van Hooydonck, and Loïc Vliegen were all animating the front of the race heading onto the second lap with Bohli eventually making it into a leading group of 20 riders going onto the penultimate lap while what was left of the main bunch sat 1’20” back and Van Hooydonck tried to bridge across in between. Splits in the front group saw Bohli slip into the second group on the road which, as the bell rang to mark the start of the final lap, sat 45 seconds behind the ten leaders before being caught by the reduced peloton with 13 kilometers to go. It wasn’t long before Zdeněk Štybar (Quick-Step Floors) began a late solo effort, but with seven kilometers to go, he sat just 20 seconds ahead of the bunch, which was only 40 riders strong, as it swept up chasing group behind him. The race came back together with just one kilometer to go, and it was then, just as the remaining riders headed onto the cobbles for the final time, that Van Poppel launched his ultimately winning move. Drucker, who came into Binche-Chimay-Binche after racing at the UCI World Road Race Championships on Sunday, pushed on behind Van Poppel after being led onto the final ascent of the climb by his teammate Jürgen Roelandts and, although the gradient began to take its toll, he eventually sprinted to sixth on the line. "It was a tough race especially with the weather conditions and the hard racing. At the beginning of the day, I wasn't feeling super great after coming here straight from Worlds. But, towards the end, on the final circuits, I felt better and better which was good as the race was really full gas at this point." "The plan at the start of the day was to make sure we followed the moves so it was good to have Nathan and Loïc following the attacks in the final before Tom made it into the big group which eventually split. Luckily for us, Team LottoNl-Jumbo worked to close the gap and Jürgen then did a good job to keep me in position going into the final kilometers before leading me onto the climb. Van Poppel went away and I didn't see it immediately. He was strong in the end and I just tried to do a good sprint behind him. It was hard though." "I finished sixth and that's a good result for me I think. It's a win or a podium finish but I was still up there and it shows that my shape is good at this late part of the season." "It wasn't actually too chaotic at the start. Of course, the pace was always high and there were crosswinds so everyone was nervous and there were small groups of two and four going away initially. When we got to Chimay at the wind turned around, six riders were able to get a reasonable advantage of up to three minutes." "A couple of teams then started to chase behind and that brought the gap down going onto the finishing circuits where we had Loïc, Nathan, and Tom in different groups. Tom was in the strong group from which Štybar jumped off the front and that was a good place to be. It was good to see us present in those moves and in the thick of the action." "Štybar was then caught just before the final climb and Jürgen led Jempy into the base of that after Team LottoNL-Jumbo had closed the gap. We had talked about doing that this morning and even though Jürgen had been sick last week, he was able to hand in there all day to help position Jempy for the sprint. Jempy said he felt a bit legless on the climb but he was still able to sprint to sixth." "All in all, it was a good ride by the team and three of our young guys were in the action when it was really kicking off and Jempy and Jürgen did what they had to do at the right moment. We can't ask for more than that." 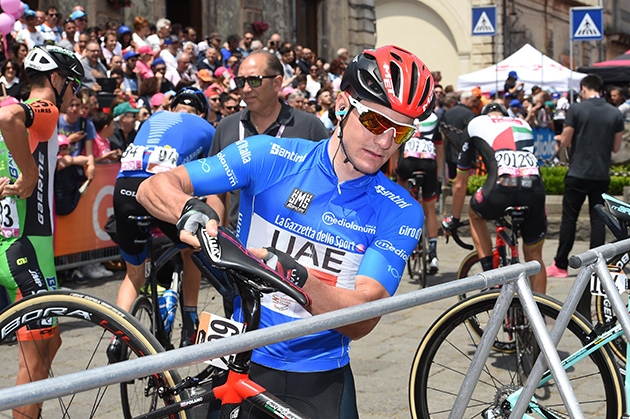 The UAE Team Emirates management confirmed for the next two years that two important pieces of the team will be in place: Vegard Stake Laengen and Jan Polanc. Vegard Stake Laengen, 29, was on Sunday in the breakaway that led the world championship road race until the final 20 km. “I’m very happy for the chance to continue for another two years with UAE Team Emirates,” the Norwegian champion explained. “We are a united group. I get along very well with my team-mates and the staff, the atmosphere is motivating and it helps me better my performance, allowing me to take advantage of special moments like what we saw in the national championship and the recent worlds. I can’t want to share more of these moments with the team together“.